Dressed in a light blue jail shirt and matching pants, Eric Holder’s eyes darted furtively from side to side as he surveyed the packed courtroom. 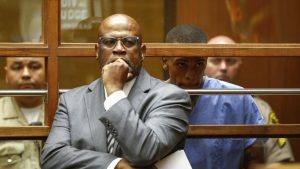 But as Holder was charged with murdering Grammy-nominated rapper and beloved community organizer Nipsey Hussle, his view was often obstructed by the bespectacled man standing squarely in front of him: his lawyer, Christopher Darden. 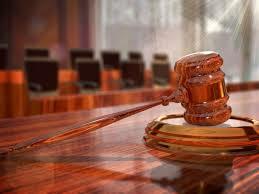 Thursday’s tense setting should feel familiar to the longtime litigator. More than 20 years ago, he was at the center of another high-profile Los Angeles murder case that sent shock waves across the city and the nation. Only back then, Darden was still with the Los Angeles County District Attorney’s Office and his job was to convince a jury that O.J. Simpson was guilty of brutally murdering his ex-wife and another man. Darden’s central role in that highly charged trial, which was fraught with racial overtones, sparked widespread outrage as some black people labeled him a “race traitor” and other observers blamed his courtroom strategy for Simpson’s ultimate acquittal. 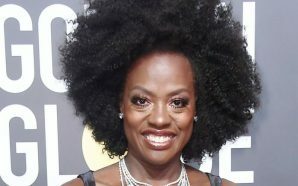 By defending Holder, Darden, now 62, is once again being vilified by some in the black community, finding himself on the wrong side of public opinion in an explosive case that has many seeking justice for the loss of a talented musician who devoted his life to improving his community. Darden did not respond to a request for comment Thursday and declined to speak to reporters at the courthouse. But as Darden has made clear in the past, negative public opinion has rarely kept him from doing what he believes is right. Born on April 7, 1956, Darden was one of eight children and grew up in Richmond, Calif., located about 18 miles north of San Francisco. His mother devoted most of her time to raising her children, and when they were older she worked in a school cafeteria. Meanwhile, his father held three jobs, bouncing between working as a welder at a naval shipyard, a laborer and a part-time bail bondsman. Darden’s father also gained “a reputation as an old, blue-collar lawyer,” he wrote, helping fellow workers or sailors file lawsuits against discrimination and other kinds of unfair treatment. “[F]or as long as anyone could remember, I was walking around saying I was going to be a lawyer someday,” Darden wrote. Darden didn’t know any actual lawyers, but that didn’t matter. He knew about their lifestyles and wanted that for himself. In the spring of 1977, Darden graduated from San Jose State University with a bachelor’s degree in criminal justice and a minor in criminology. He went on to get his law degree from the University of California, Hastings College of the Law and passed the state’s bar exam — widely believed to be one of the most difficult in the country — on the first try. After a brief stint working for the National Labor Relations Board in Los Angeles, Darden made the jump to the district attorney’s office in the early 1980s. As a young prosecutor, Darden wrote that he earned a reputation for “irreverence and cockiness” and developed a “fiery, aggressive style” in the courtroom. Darden’s caseload went from misdemeanor felonies to murders, gang crimes and police violence. In the late ’80s, he was involved in the state’s case against Joseph Danks, the “Koreatown Slasher,” who was accused of murdering six people and attempting to kill two others in a series of stabbings. 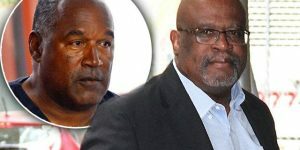 Then Simpson, California’s hometown football hero and an international celebrity, was arrested in June 1994 and accused of stabbing his ex-wife Nicole Brown Simpson and waiter Ron Goldman to death. As an experienced prosecutor with numerous convictions under his belt, Darden wrote that he had a feeling he would have a role in Simpson’s case, but he “didn’t look forward to it.” It had been 13 years as a prosecutor and he hadn’t taken a real vacation. He was tired. And there was also the ominous warning from his father. “So, you think I shouldn’t get involved?” Darden responded. “That meant no TV, which meant I didn’t have to worry that every homie in Southern California would be wondering if I was betraying my race,” Darden wrote, adding that he had a “duty to the prosecutors’ office, to the families of the victims, and even to the black community” to work on the case. 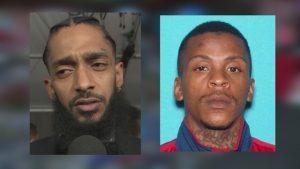 Simpson’s 11-month trial transfixed the nation, and in a city plagued by racial discrimination, the question of double-murder was swiftly eclipsed by issues surrounding race. But as critics have since argued, Darden’s prominent role in the trial likely did more harm than good to the prosecution’s case. Many have pointed to the moment when Darden forced Simpson to try on the bloodstained leather gloves — which resulted in Johnnie Cochran’s famous line, “If it doesn’t fit, you must acquit.” — as a turning point. “The glove demonstration provided the classic example of Darden’s shortcomings as a trial lawyer — his impetuousness, his immaturity, his failure to prepare either himself or his witnesses adequately,” Toobin wrote. Even Darden knew he made a costly mistake. In the aftermath of Simpson’s acquittal, it was unclear if Darden would return to law, The Washington Post’s William Booth wrote in October 1995. More than two decades have passed since the Simpson trial and in that time Darden left the district attorney’s office and became a defense attorney, opening his own firm. He also appeared as a legal commentator on news networks including CNN, NBC and Fox News. Recently, Darden made headlines for representing former NFL player Brandon Browner, who is appealing an attempted murder conviction, according to Bleacher Report. On Thursday, Darden stood in front of Holder to block him from cameras, according to CBS Los Angeles, while entering a plea of not guilty on behalf of his client. 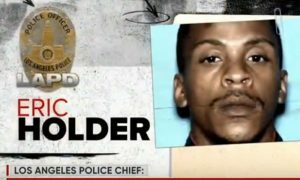 At least six stone-faced deputies also surrounded Holder, who arrived at Los Angeles County Superior Court in a squad car under heavy security, the news station reported. Following his arrest on Tuesday, Holder has received many threats on social media, according to the Times. Holder’s bail was set at $5 million; his next court date is May 10. When news spread that Darden was defending Holder, social media exploded with reactions, many critical of the attorney. By early Friday, Darden’s name was still a top trending term on Twitter.